Bioengineering to save bees through beer. Our food system relies on bees as our primary pollinators. According to the USDA, bees do $11-15 billion worth of work for American farmers every year. Unfortunately, bee colonies face extinction – a phenomenon known as Colony Collapse Disorder (CCD). One of the primary causes of CCD is the parasitic varroa mite. "Warmer temperatures and extreme weather events are harming the production of hops...Rising demand and lower yields have driven the price of hops up by more than 250% over the past decade." Left, a varroa mite. Right, a hop flower. Surprisingly, the hop beta acids responsible for flavoring and preserving beer have also been found to kill varroa mites. When cardboard strips saturated with hop beta acids were inserted into packages of bees, more than 90% of the mites died, with no effect on bee mortality. Beecosystem connects brewing and beekeeping using a genetically modified brewer’s yeast that synthesizes hop beta acids. These beta acids will supplement or replace hops in beer brewing and help protect bees from the parasitic mites. The Guodong Wang lab at the Chinese Academy of Sciences has successfully modified a strain of yeast to create hop beta acids as a byproduct. We are currently in the process of pulling the hop-related DNA from their strain of yeast and inserting it into our strain of brewing yeast. Once our yeast is modified, we'll brew some beer and see what happens! Working on our yeast at Genspace, a community biology lab in Brooklyn. Beecosystem is a collaboration between Dana Abrassart, Chester Dols and Jenny Lim. We owe a great debt of thanks to Stefani Bardin, Kadallah Burrowes, Daniel Grushkin, Elizabeth Hénaff, Alison Irvine and Leslie Mitchell. Do hop acids really work as a miticide? Betatec already sells a miticide made with hop acids. It seems to work well, but its reach is limited due to its high price. Our product would hopefully make this naturally-occurring miticide more accessible to beekeepers. Aren't you worried about GMOs? We're very concerned about releasing GMOs into the world, and hope to consult with experienced companies like Intrexon and Gingko Bioworks to make sure we take all possible precautions. Will you put hops farmers out of business? Unfortunately, hops farming is already in danger due to climate change. When a severe drought hit Washington (where over 70% of U.S. hops are grown) in 2015, farmers tried to water their hops with groundwater. Jeremy Marshall, head brewer at Lagunitas, likened it to "brewing with Alka-Seltzer." Hops are amazing, and we believe they'll remain popular. But as climate change and interest in craft brewing propel the price of hops exponentially higher, we hope our product will provide another source for brewers as well as bees. How will you make beer? We've been experimenting with homebrewing since taking up our project. 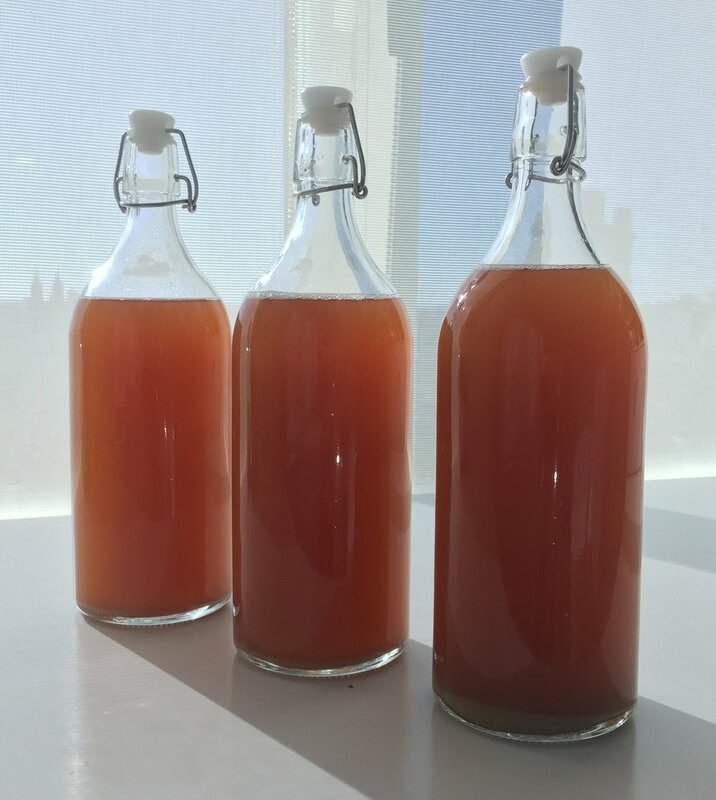 On the left is a previous batch of homebrew which we served at the Biodesign Challenge in June 2017. Why don't you just make beer with the Guodong Wang yeast? Their strain of yeast is lab yeast, which probably doesn't taste very good. Brewer's yeast has been bred and selected for taste over time. When can I try your GM beer? Given the regulations surrounding alcohol distribution and GMOs, it will probably be a while before we hit the market. But we hope to do so soon!